When the Twins signed international free agent Wander Javier to a franchise-record $4 million bonus in 2015, they knew it would be a long road ahead for the 16-year-old. Although the immensely skilled infielder is still only beginning to embark upon that road, he's already leaving his imprint, and drawing national attention. A lot. And national analysts everywhere are starting to see it. Javier made only one prominent Top 100 list this year – cracking Baseball America's rankings at 95 – but plenty of others have taken notice. MLB.com's Jonathan Mayo named Javier one of his "Just Missed" prospects, adding that he "could shoot up the top shortstops list in a hurry." FanGraphs cited Javier as one of the lower-ranked prospects they love, grouping him among "highly skilled infielders who should be top-100 prospects next year if they add physicality." The Baseball Prospectus team has encountered so much steam on the young Dominican that when inviting readers to ask prospect questions in a Top 101 chat, they implored "not about Wander Javier, we beg of you." The buzz around this young man is more than understandable. He was considered an elite talent when he made his way stateside three years ago, and has only backed that up with his performance on the field. As a pro, the 19-year-old has hit .301/.386/.497 with with six homers in 50 games between two levels of rookie ball. In 2016, Javier made only 30 plate appearances in the Dominican Summer League before a hamstring injury shut him down. Still, the Twins sent him straight to Elizabethton last summer in what was considered an aggressive promotion, pushing him past the Gulf Coast League entirely. Javier got off to a slow start – 3-for-19 with eight strikeouts and one walk in his first six games – but he tore it up the rest of the way, batting .319 with a .906 OPS. In October, Baseball America named Javier the second-best prospect in the 2017 Appalachian League, behind only fellow teen shortstop (and high-dollar international signee) Kevin Maitan. "He flashes an above-average feel for the barrel and should grow into more power as he gains weight," wrote BA's Justin Perline. "As he learns to recognize pitches better and strike out less, he should be able to hit at the top of the order." While it's almost impossible to tell at this point, Javier shows all the attributes of a guy who can stick at shortstop. He was raw and mistake-prone in 2017, but that's not unusual. His arm is excellent, enabling him to make plays deep in the hole. He's very quick and agile. A year ago in this section, Seth pointed to "Everything. I mean, come on… The kid is just 18 years old." Javier is 19 now, and considerably more accomplished, but that sentiment remains true. We ranked him in the same spot this year as we did last, just on the cusp of the the Top 5. In some ways that's a compliment: It isn't easy to hold ground in this upstart system. But in order to climb to that top tier, the shortstop must continue refining his heralded tools. He needs to get more consistent in the field. He needs to improve his pitch recognition and cut down on the whiffs. He needs to start reading pitchers better, and converting his solid speed into baserunning impact. Javier needs to do all the above against better competition than he's ever faced, while culturally acclimating from the (already unfamiliar) southeastern United States to midwestern Cedar Rapids and full-season baseball. And keep in mind: he is still three Christmases away from his first legal sip of spiked eggnog. In other words, patience is warranted with this exceedingly talented young infielder. If he catches on fast in the Midwest League, however, the hype train will hit overdrive and Minnesota's depth of upcoming shortstops will quickly become the envy of the league. 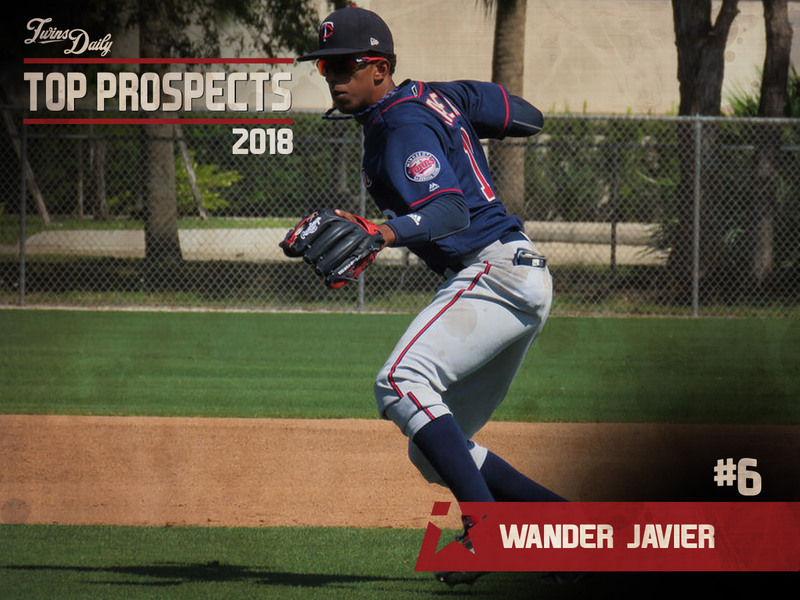 Get to know more about Wander Javier and much more in the 2018 Minnesota Twins Prospect Handbook. I could see Lewis 3B, Javier SS, Polanco 2B, Sano 1B. Whew! How about Rooker at 1st and Sano DH? I'm glad the Twins started signing top (international) free agents. Almost seems like the prospect guys are apologetic; like they couldn't rate him higher for some unknown and possibly nefarious reason. I'm going to enjoy the Wander Years. I like all our SS prospects. I wonder if any of them can pitch? I'm cautiously optimistic about Javier. The Ks (27.7%!) and the BABIP (.410!) scare me a little bit. I think he is slightly overrated at #6 - I'd rather have Baddoo right now. It's too early to be too excited since baseball does grind players down and injuries destroy dreams, but this player has really captured the imagination of so many that I am catching the Wander fever too and I am delighted that the FO seems aggressive in their promotions. So Javier, Lewis, Baddoo, Kirilloff, Bechtold, Miranda and Rortvedt are all going to start the season in CR? That should be fun.They might need to promote Lewis pretty quickly, if they want to keep everyone getting their SS reps.
Or, do they move Lewis to CF and Baddoo to a corner? If Lewis moves off of short he's better in the outfield with his speed.A lot of scouts see him as a CF, though that position may be occupied at the MLB level for a while.I could see switching Lewis and Javier around too. I think Lewis might get some time in CF as they try to work everyone into the lineup, but I hope they keep developing him at short.I do think he ends up in Ft Meyers by midseason at latest. Baddoo is probably a corner OF long-term. Can't wait to see how he does in full-year play against less random competition. (let's face it, rookie ball has a lot of lottery tickets and never-will-be's in it) there's a ton to like and he's a fine prospect. I think he'll likely have some significant advancement in at least one area of his skill set, but I have no idea what that will be. I'm guessing it might be defense; he's talented enough that at this level he could keep swinging at way too many pitches...and still have big success as a hitter. Have to stay patient with this guy, but it's going to be fun watching him and Lewis chase each other through the system. Hope it doesn't turn into Wanderlust. Who is going to play SS at Ft. Myers? I'd put Wander at CR or FM and Lewis at the other. Let each play SS exclusively and see in several years who wins the SS battle and who needs to be moved to another position. Same with Gordon at AAA and Polanco in Minnesota. . Leave them all at SS as long as possible and give the brain trust amble opportunity to view each one of the 4 and then decide which ones to move away from SS. I'd agree, but maybe start Wander in EST with Lewis starting in Cedar Rapids.When Lewis gets bumped up to Fort Myers, bring in Wander.Or start them both there.Only trouble is what happens if Wander out performs Lewis?Then I'd go as bold as saying Palacios isn't getting much love here.He deserves some recognition and say he's able to make that jump to AA this year and still hit, we'd have yet another top 100 prospect in the mix. Twins fans that are worried about logjam of SS prospects and the fact that you don't have an ace starter, my guess is the two issues work themselves out this year by the deadline.Without question if Wander hits well out of the gate, he'll climb up prospect rankings and can be your centerpiece of a top SP return. How about Rooker at 1st, and Sano gone for that pitcher we need? Polanco mans second until Severino arrives along with Lewis and Javier.Could also see Palacios or Arraez winning the second base spot for many years. Then I'd go as bold as saying Palacios isn't getting much love here. This.I'd be interested to hear from those that have seen both, what separates these two by such a seemingly wide margin in prospect rankings.They both had very similar success as 18-year-olds at Elizabethton.Since then, it took Palacios a little more than a year to figure out low A, but he continues to show promise.Is Javier's upside offensively just that much better?Or is it defense?Or mostly just the $4 million? Projectability. It's like trying to compare Blayne Enlow to Zack Littell or something like that. Your imagination can get bigger the younger and lower down in the minors a guy is. The higher up a guy gets, you start to see things that limit your imagination. Javier and Palacios may have had a similar OPS in E-Town, but they're different types of hitters. Palacios makes a ton of contact but doesn't draw walks. Javier strikes out more, but has been better at getting on base. At this point, I don't have much hope in Palacios filling out much more, where as I think Javier is likely to add some bulk. That may be hard to see looking at pictures of him now, but remember what Sano looked like when he was a 19-year-old shortstop? They both had crazy high BABIPs in 2017 -- Palacios at .356 in Cedar Rapids and then .332 with the Miracle, but Javier's was .410! I'm not one to automatically assume that's luck, since guys who hit the snot out of the ball on a regular basis and/or run well are going to have higher BABIPs, but I just thought that was something interesting to note. The evaluations on defense for both of these guys are all over the place. Just in what I could see on MiLB.tv (not a great way to evaluate someone but the best I can do) I didn't come away super impressed with Palacios' athleticism in the field. But I've read some very positive reviews from others about his defense. BP said he was a plus-defender and a solid runner. If I was more convinced that was the case, I'd probably have had him inside my top 15 as opposed to 21st. I've only seen brief clips of Javier in the field, but people rave about his athleticism and arm. Part of the expectation that he'll bulk up comes with some people forecasting a future move to third base. I'd rather that than a move to second, which is my fear concerning Palacios. And, yes, the $4 million is certainly an eye opener. Don't know why you think that, BA grades his arm at SS as a future 55 and during the scouting circuit his arm was always regarded as a plus asset, it waned during the GCL but by all reports was back to full strength in Cedar Rapids.The waste would be putting him at the hot corner as his athleticism and speed could help incredibly in covering ground in the OF. He has above average arm strength and moves better to his right, which should allow him to stay at SS as he climbs the ladder. From what I saw in the FSL, I'd agree, but he better hit well from the beginning as he is likely starting in the FSL again and has Royce and Wander nipping at his heels. Release him. We have too many shortstops. If you want to comp Lewis' SS arm within the organization it's more similar to Gordon's which is graded as a 55-60 at the position. Please elaborate on this solution. How did I know someone would take this seriously? I'm making fun of the people who think we need to trade a SS ASAP....even though the likelihood of any of them (Gordon, Lewis, Javier) sticking as SS isn't a given....maybe even not likely.